Aspirants can get the latest updates regarding the KPSC JTO Hall Ticket 2018-2019 from this article. The candidates who are ready to participate in the written examination need to download the Karnataka PSC JTO Admit Card 2018-2019 before going to the test. Soon, the Karnataka Public Service Commission will release the KPSC Junior Training Officer Hall Ticket 2018-2019 on its official website that is kpsc.kar.nic.in. Therefore, for the sake of applicants, we have also provided the details related to the KPSC JTO Admit Card 2018-2019 here. So competitors can refer this page to get an overview of the KPSC Junior Training Officer Admit Card 2018-2019. In addition to this, we have also provided the Exam Pattern and the Selection process for the Karnataka PSC Junior Training Officer Vacancies. The Karnataka Public Service Commission has not yet released the information about the KPSC JTO Hall Ticket 2018-2019. Many of the applicants are eagerly waiting for the Karnataka PSC JTO Admit Card 2018-2019. The candidates need to wait few more days to download the KPSC Junior Training Officer Call Letter 2018-2019. 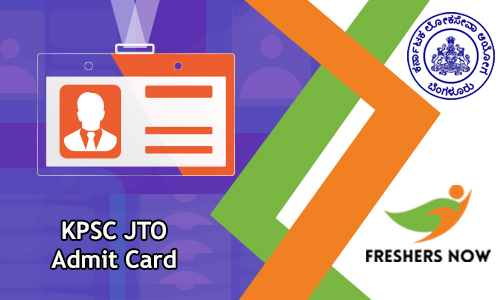 To download the KPSC JTO Admit card 2018-2019 applicants need to enter their application number and date of birth. Therefore, applicants be ready with their date of birth and application number. After the release of KPSC JTO Admit Card 2018-2019, we will activate the link in this article. Therefore, for the fresh updates applicants need to visit our website frequently. By referring the below table the applicants can get an idea about the KPSC JTO Admit Card 2018-2019. Therefore, for the sake of candidates, we have gathered all the particulars regarding the KPSC Junior Training Officer Hall Ticket 2018-2019. A few days back Karnataka Public Service Commission has announced the notification for the Junior Training officer of 1520 Vacancies. Therefore, the interested and eligible aspirants need to register quickly. The applications for the registration will be closed on March 20th, 2018. In addition to this, we have also provided the KPSC JTO Recruitment 2018-2019 link for the sake of applicants. By clicking on the link competitors can register for the KPSC JTO Recruitment 2018-2019. The Karnataka Public Service Commission is planning to organize the written examination for all the applied candidates. So, the aspirants need to prepare well for the examination. Therefore, for the candidates, we have provided the KPSC JTO Previous Papers 2018-2019 and KPSC JTO Syllabus 2018-2019 on our website. So candidates can check the updates on our website. The KPSC will release the KPSC JTO Admit Card 2018-2019 before 10-15 days prior to the examination date. Applicants after completing their registration process can visit this page for the updated information about the KPSC JTO Hall Ticket 2018-2019. Before starting the preparation applicants need to know the Exam pattern of the examination. The candidates need to prepare well for the examination basing on the syllabus and the exam pattern. Moreover, Exam Pattern plays a crucial role at the time of preparation. Therefore, in this section, we have provided the detailed information related to the KPSC JTO Exam Pattern 2018-2019. KPSC JTO examination is an objective type examination. The examination consists of two papers. Each paper is for 200 marks. For each wrong answer, there will be a 0.25 negative marking. Therefore, applicants need to answer the questions carefully in the examination. Moreover, in below sections, we have also provided the steps to download the KPSC JTO Admit card 2018-2019. In addition to this, we have also mentioned the Importance of Karnataka PSC JTO Hall Ticket 2019-2019. The Karnataka Public Service Commission has planned the selection process to fill the 1520 Junior Training Officer Vacancies. For all the applied aspirants the authorities will conduct the written examination. The qualified candidates need to face the Personal Interview. At the time of Personal Interview, some particular documents need to submit to the officials of the Karnataka Public Service Commission. Therefore, applicants need to verify all the documents before attending the interview. In addition to this, at the time of written examination applicants need to submit KPSC JTO Admit Card 2018-2019. Without the KPSC JTO Call Letter 2018-2019, the candidate will not allow into the examination hall. Therefore, the applicant needs to carry KPSC JTO Hall Ticket 2018-2019 along with some mandatory document to the examination hall. Moreover, Karnataka PSC JTO Admit card 2018-2019 is used to find the false candidates who are appearing to the examination without completing their registration process. After downloading the KPSC JTO Admit Card 2018-2019 aspirants need to verify all the details printed on the admit card. If any misprints are found the candidates need to inform to the authorities of the Karnataka Public Service Commission. Moreover, KPSC Junior Training Officer Hall Ticket 2018-2019 contains information like Personal details of the candidate and the examination details. Before downloading the Karnataka PSC JTO Call letter 2018-2019 the competitors need to know the procedure to download the admit card. Therefore, in this section, we have provided the step-wise procedure to download the KPSC JTO Admit card 2018-2019. For further information, aspirants can visit our website freshersnow.com. Hope, the given article related to KPSC JTO Admit Card 2018-2019 is useful to all the aspirants.